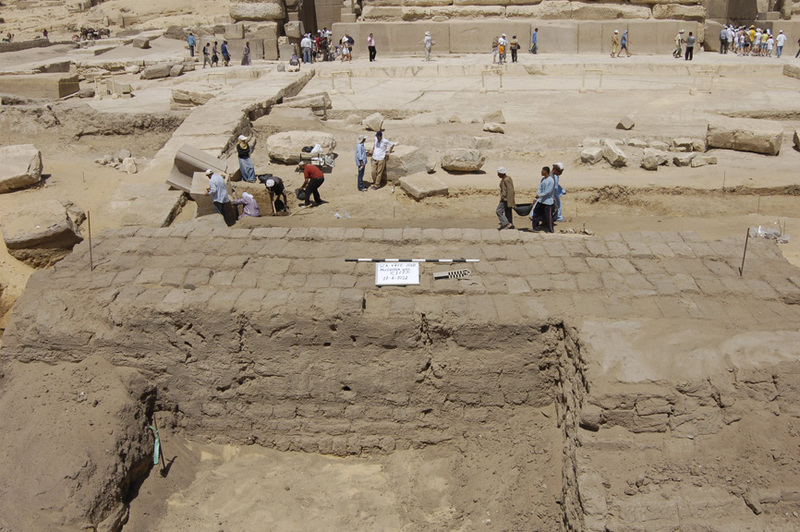 The Egyptian mission headed by Dr. Zahi Hawass discovered a huge mud brick wall dated back to Tutmoses IV (1419-1410 B.C) in the area opposite of Khafre’s Valley Temple in Giza. 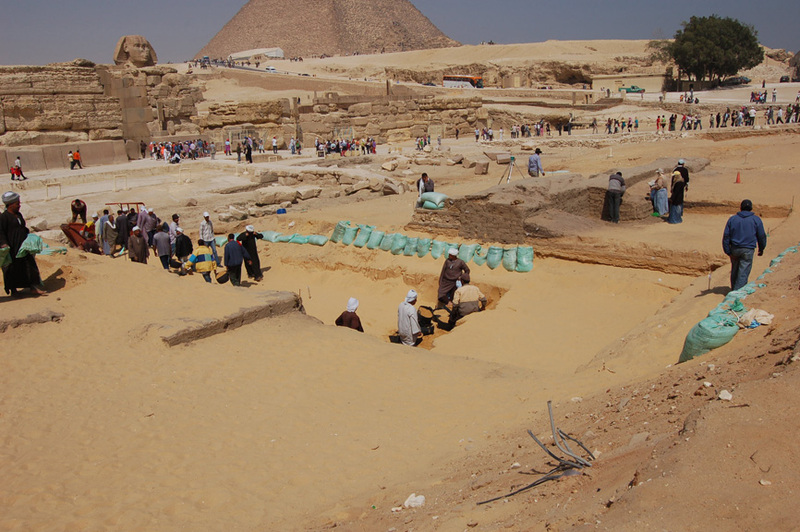 Minister of culture Farouk Hosni announced the discovery and said it came as a part of the excavations by SCA within the development plan of the Pyramids area. Dr. Zahi said that wall consists of two parts. The first part is to the east of the Valley Temple and the Sphinx and it measures 86 meters from north to south with height of 75 cm, the second part of the wall is located at the south of the temple and it is 46 meters from east to west with a height of 90 cm. The two parts meet in a point at the southern part of the eastern wall. There is a wall stretches 12 meters and 3 meters high on the north of the Sphinx that was built by Tutmoses IV after the dream he saw when he was asleep near the Sphinx after an exhausting hunting trip. In his dream the Sphinx (Known as Hor am Akht at that time) asked the King to remove the sand around as it suffocating the Sphinx and it was done. The mission also found mud brick walls at the west of the tunnels that were discovered before in the eastern area of the Valley temple. 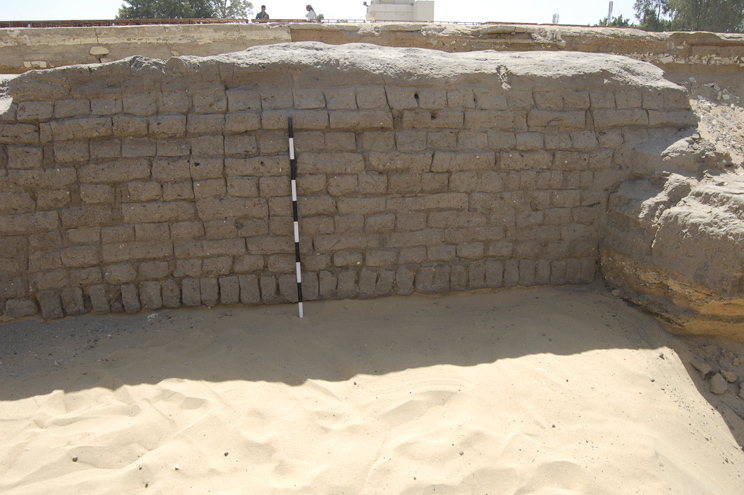 Dr. Zahi Hawass believes that these walls are the remains of the Pyramidian city of Khafre where the priests and high officials of khafre lived till the end of the Old Kingdom. Essam Shehab, the Valley Temple excavation inspector said that the mission has dug a 6 meters deep hole in front of the Valley Temple to make sure there was no activity of the Middle Kingdom in that area and the excavations still going on the reveal the rest of the wall and the secrets still hidden under the sand.